High-temperature superconductors exhibit a frustratingly varied catalog of odd behavior, such as electrons that arrange themselves into stripes or refuse to arrange themselves symmetrically around atoms. Now two physicists propose that such behaviors and superconductivity itself can all be traced to a single starting point, and they explain why there are so many variations. This theory might be a step toward new, higher-temperature superconductors that would revolutionize electrical engineering with more efficient motors and generators and lossless power transmission. J.C. Séamus Davis, the James Gilbert White Distinguished Professor in the Physical Sciences at Cornell and director of the Center for Emergent Superconductivity at Brookhaven National Laboratory, and Dung-Hai Lee, professor of physics at the University of California-Berkeley and faculty scientist at Lawrence Berkeley National Laboratory, describe their theory in the Oct. 7 issue of the Proceedings of the National Academy of Sciences. 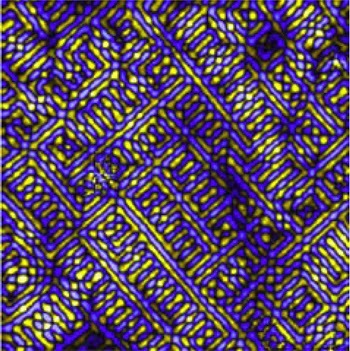 The oddities, known as intertwined ordered phases, seem to interfere with superconductivity. "We now have a simple way to understand how they are created and hopefully this understanding will help us to know how to get rid of them," said Lee. Superconductivity, where current flows with zero resistance, was first discovered in metals cooled almost to absolute zero. Recently, complex crystals of copper, iron and some other metals combined with trace elements have been found to superconduct at temperatures up to around 150 Kelvins (degrees Celsius above absolute zero). For the last 10 years, Davis has examined these materials with scanning tunneling microscopes so well insulated from vibration that they can scan a surface in steps smaller than the width of an atom, while measuring the energies of electrons under their probes. 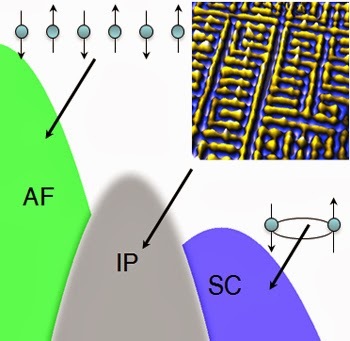 He has discovered several of the intertwined phases of high-temperature superconductors, which appear in scans as unexpected arrangements of the electronic structure, and found them to vary widely from one material to another. "[Our work] was not random; we were trying to map out all the known phenomena," Davis said. Most subatomic particles have a tiny magnetic field a property physicists call "spin" and electrical resistance happens when the fields of electrons carrying current interact with those of surrounding atoms. Two electrons can join like two bar magnets, the north pole of one clamping to the south pole of the other, and this "Cooper pair" is magnetically neutral and can move without resistance. Lee and Davis propose that this "antiferromagnetic" interaction is the universal cause not only for superconductivity but also for all the observed intertwined ordering. They show how their "unified" theory can predict the phenomena observed in copper-based, iron-based and so-called "heavy fermion" materials. But if the cause is always the same, why do different materials exhibit different oddities? The difference, they say, is in the varying energy levels of the electrons that are free to carry current, which can be described by a mathematical structure called the "Fermi surface." The new high-temperature superconductors are derived from orderly crystals where the same arrangement of atoms is repeated over and over and the spins of electrons alternate up and down from one unit cell to another. Although this favors antiferromagnetic interaction, electrons are not free to form Cooper pairs. Doping with trace elements distorts the crystal structure and removes some electrons, changing the Fermi surface. Whether Cooper pairing or some other ordering will take place depends on the shape of the Fermi surface, the researchers said. Heat makes atoms move and can shake Cooper pairs apart, so the holy grail is to design a material where the pairs are bound together so strongly that superconductivity can happen even up to room temperature. It might be possible to describe a Fermi surface that would create that condition, and perhaps then imagine what crystal structure it would require. "Ideally we would like to be able to tell the materials scientist to put elements X, Y and Z together," Lee said. "Unfortunately we can't do that yet."